A visit, that is. From Brian. Before breakfast. I do have strong coffee out, though. Last year, one book I very much liked on many levels was author/illustrator (and former art director and graphic designer) Brian Biggs’ On Land (Balzer + Bray, September 2011), what is, it turns out, the first in an Everything Goes series of picture books he has planned (as you’ll read below, if you’re so inclined). I’m having a McCarty Party today. Caldecott Honor author/illustrator Peter McCarty, that is. I love his picture books. You never quite know what he’s going to do next. (The soft-focus art of Hondo and Fabian? 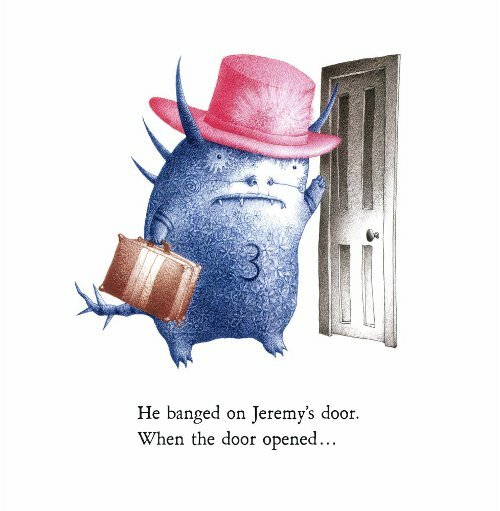 Or the spikier-lined art of Jeremy Draws a Monster, featured here at 7-Imp in ’09?) And he can go from quiet to funny in one second flat. 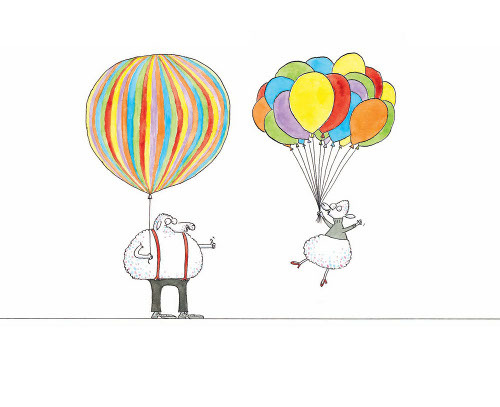 The books he’s illustrated or both written and illustrated are smart, never talking down to children, and with each new book, he seems to get more inventive in his artwork. I always look forward to a new McCarty title. “Harry is going out. ‘Will you be good, George?’ asks Harry. Tomorrow morning at Kirkus, I take a look at the new picture book from author and illustrator duo Kyo Maclear and Isabelle Arsenault. It’s called Virginia Wolf, and I love it. (I also very briefly discuss the topic of depression in contemporary picture books.) The link will be here tomorrow. 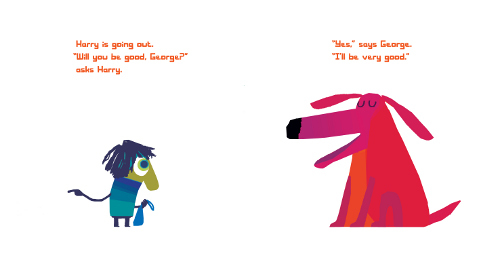 Last week, I covered Chris Haughton’s Oh No, George!, which will be released by Candlewick in March. I noted in that write-up that Haughton is a British author/illustrator, but he’s really Irish (and currently living in London). So, that’s for the record there. Error all fixed. I like this book. Funny and puts the very quirk in quirky. But there’s more about it at last week’s link. Above is a spread from it, and here’s one more. Enjoy. OH NO, GEORGE!. Copyright © 2012 by Chris Haughton. Reproduced by permission of the publisher, Candlewick Press, Somerville, MA on behalf of Walker Books, London. Meet Davy’s Mom and Dad. Davy’s got these doting folks all to himself, and life is good. That is, till his new, little brother arrives. And then the next one. And the next one. And the one after that. 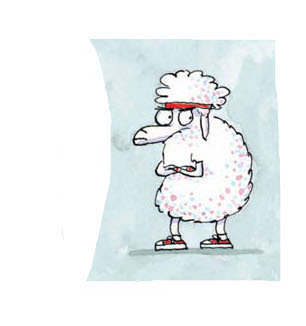 This is Another Brother (Feiwel & Friends), the new picture book from author/illustrator Matthew Cordell, the second one he’s both written and illustrated (though he’s illustrated many others), to be released at the end of this month. And it’s funny. So very funny. You can see Davy below and how he feels about these encroaching siblings. Cordell had me at the headband. Clearly, Davy aspires to rock star status. 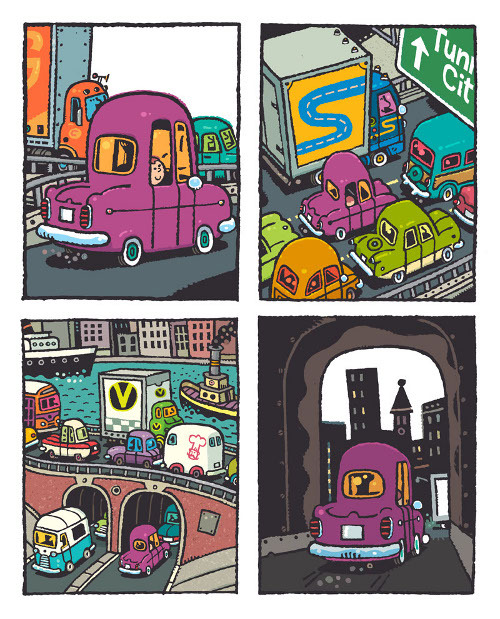 And that’s just it: That’s the kind of detail Cordell will put into his illustrations that ring so true to childhood. You know that kid who was so earnest, tried so hard, successfully reached a certain level of cluelessness as to the fact that others disdained (and quite possibly snort-laughed at) his rock star yearnings? Didn’t care so much that he may have been construed as dorky by others? (Maybe that kid was you. It certainly was me, though I wanted to be an anchorwoman, not a rock star. Er, no comment.) Yeah. That. Cordell nails it here. Well Now. That Was a Fun Morning. 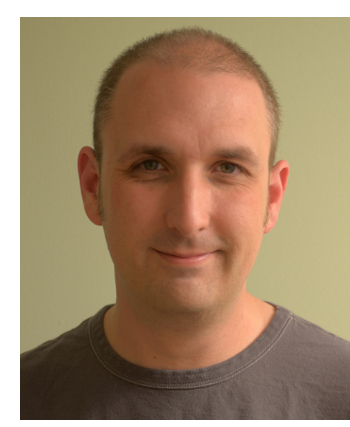 For now, though, a short and sweet post: I just realized that when Chris Raschka visited in 2009, he shared an early image from A Ball for Daisy, which picked up today’s Caldecott Award. Here it is. You can click on it to embiggen it. Enjoy! Image re-posted from this earlier interview. 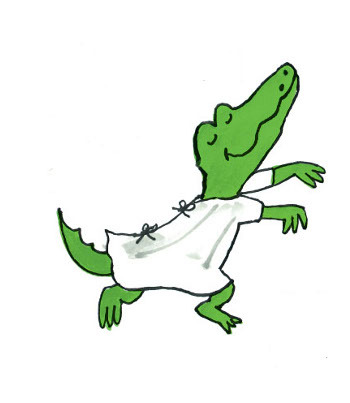 First off, for anyone who may be reading who is not a fellow picture book junkie, here’s a Lyle 101: Lyle, the crocodile, debuted in 1962 in author/illustrator Bernard Waber’s The House on East 88th Street. 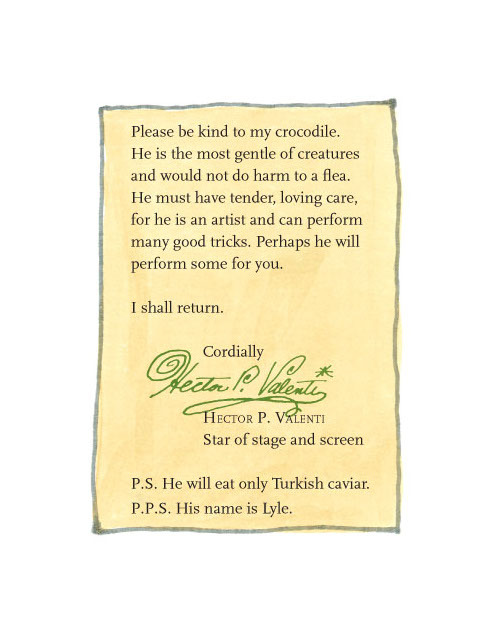 This book was followed in 1965 by Lyle, Lyle, Crocodile, probably the most famous Lyle book, and a total of eight books exist in the series. 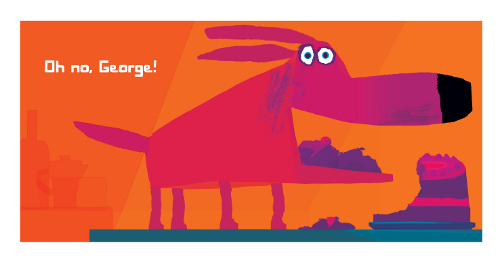 Tomorrow morning at Kirkus, I take a look at illustrator and designer Chris Haughton’s newest picture book, Oh No, George! The link will be here. Last week, I weighed in on Shana Corey’s picture book biography, Here Come the Girl Scouts!, illustrated by debut artist Hadley Hooper. That link is here, if you missed it. 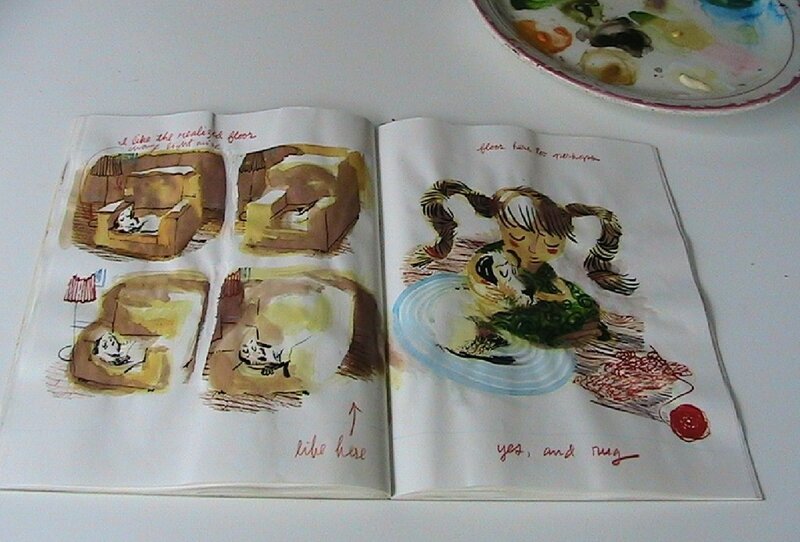 Today, I feature some spreads from the book (a spread above, which I loveloveLOVE, and a couple more below). Enjoy. I initially created this interview format, the Seven Questions Over Breakfast one, for brand-new illustrators — so that my readers and I can meet up-and-coming artists. Turns out I use it for more experienced authors and artists as well, ’cause the ready-made format, given my busy schedule, makes it, quite simply, easier to post any interviews at all. But my point? 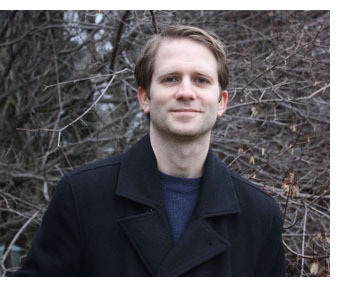 Today’s featured illustrator, Stephen Shaskan, is definitely new to the scene, his first published picture book released last Fall by Chronicle Books (and featured here at 7-Imp). Having this cyber-breakfast with him is, I think, a good introduction, a way for all of us to get to know his work a bit more. Stephen’s thickly-lined and quite manic art from A Dog Is a Dog was met with good reviews. “Shaskan’s debut looks simple,” wrote Publishers Weekly, “but it’s in fact a polished and controlled piece of work. … There’s a chunky, woodcut feel to Shaskan’s hip and cheery art, and he gives each of the animals abundant personality.” As I already said here at 7-Imp in the 2011 post, I liked his debut. It’s a fun and clever book for the youngest of readers, and I look forward to what comes next from Stephen (whose last name, he likes to assist readers, rhymes with “trash can”). Well, dim sum for breakfast is new for me, but I’m game. I’m going to put on lots of coffee, too, as usual. “Puffins have two legs, too! 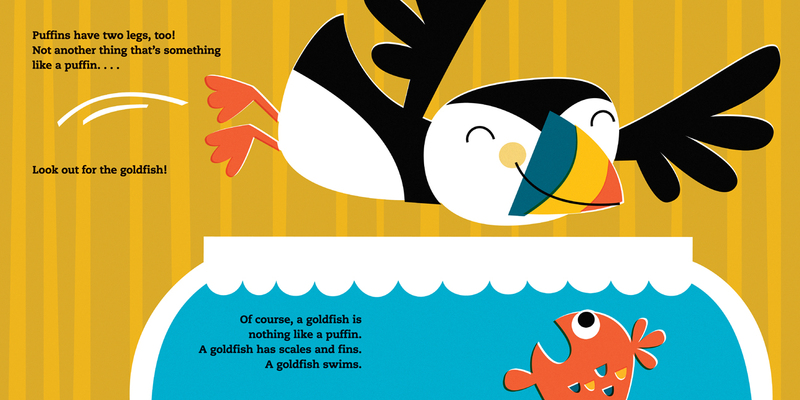 Not another thing that’s something like a puffin. . . .
Look out for the goldfish! Of course, a goldfish is nothing like a puffin. This morning, I’m featuring the last two 2011 titles I had planned to feature last Fall in a very short series of posts highlighting some good picture books for the wee’est of readers. Over the years, I’ve enjoyed many of Bob Barner’s picture books for very young children. Last September, he released Animal Baths (Chronicle Books). Using cut paper, ribbons, and pastels, he very colorfully shows the various ways different animals get themselves clean. His rhymes are appealing for the youngest of listeners, and the cut paper and ribbons in his artwork make for very textured spreads, which also cover every inch, these animals ready to burst forth from the pages. It all works. Bob’s pig spread opens this post, and even more spreads are included below. In September, Candlewick released Sue Soltis’s Nothing Like a Puffin, illustrated by Bob Kolar, which Kirkus gave a starred review. “Look, a puffin! What a marvelous creature, one of a kind and amazing,” the book opens. “Indeed, there is nothing like a puffin.” Bob’s friendly puffin is here to greet us readers at the start, and he makes his presence known to many, usually wreaking havoc. Soltis, giving readers a subtle lesson in comparisons and inferencing (all disguised in great fun), pairs this puffin up with a ladder, a house, a newspaper, a pair of jeans, a goldfish, a penguin, and just about everything in between, asking whether or not they really are that different. Barner’s digital illustrations give clues to young readers, and the energy and movement in the illustrations really propel the book along with a brisk, happy pace. There’s lots of humor here, too, given that the puffin usually leaves confusion and slight chaos in his wake. “…Who was this man, and what caused him to start drawing in his old age? My Kirkus column for this week goes up tomorrow, as usual — not today. (Yup, I’m posting a bit early, but I wanted to go ahead and share some art today.) 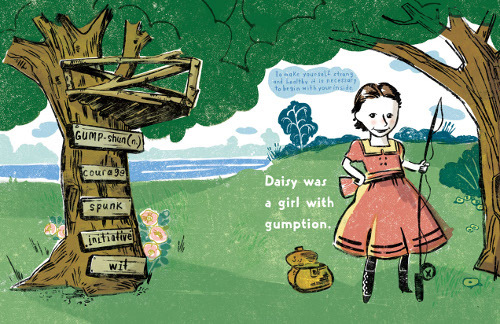 Tomorrow’s column, which will be here in the morning, will be about the new picture book biography of Juliette “Daisy” Gordon Low, written by Shana Corey with artwork from debut illustrator Hadley Hooper. Low was the founder of the Girl Scouts, and I like this book — thank goodness for Shana Corey’s devotion to picture book biographies about remarkable women. So, more on that tomorrow. In last week’s column, I took a look at some illustrated books I’m eager to see in 2012. One of those books mentioned was D.B. 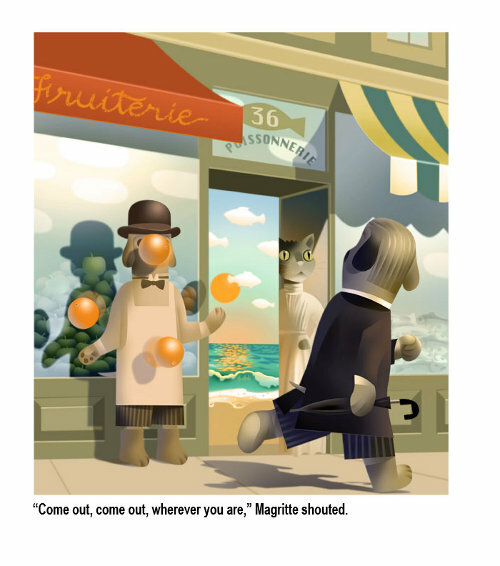 Johnson’s Magritte’s Marvelous Hat. (An illustration from that opens this post.) Even though it’s scheduled to be released in April by Houghton Mifflin (yikes, sorry I’m posting this so early — I just get excited), I was able to see an F & G of the book. And then I contacted Don about sharing some art and early sketches from it.